As director/writer, Soopum’s short films include “Island to Island,” winner of a 2002 Student Academy Award, and “Fish in the Sea Is Not Thirsty,” an official selection of the 2002 Cannes Film Festival (Quinzaine). “Make Yourself at Home,” Soopum’s first feature film as a director/writer, was invited to the 2008 Pusan International Film Festival, Gala Presentation; Oldenburg Film Festival; San Diego Asian Film Festival; and Athens Film Festival. 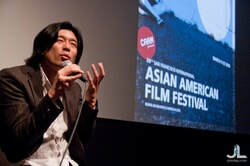 As cinematographer, Soopum’s films include “Michellville” (dir: John Harkrider), which screened at the 2005 Sundance Film Festival (American Spectrum), and “SA-KWA” (dir: Yi-Kwan Kang), winner of the International Critics Award at the 2005 Toronto International Film Festival. Soopum holds M.F.A. degrees from American Film Institute (cinematography) and New York University (film directing).